​If you open an 8870 system cabinet, you will find circuit boards or plates, and if you open these plates you won't find a CPU chip (actually that's not completely correct as Nixdorf loved the Z80 CPU and you find them in all their peripherals), but the main system CPU was actually bit-slice technology; this means it was fabricated from many separate components all working together to perform the actions of a CPU. 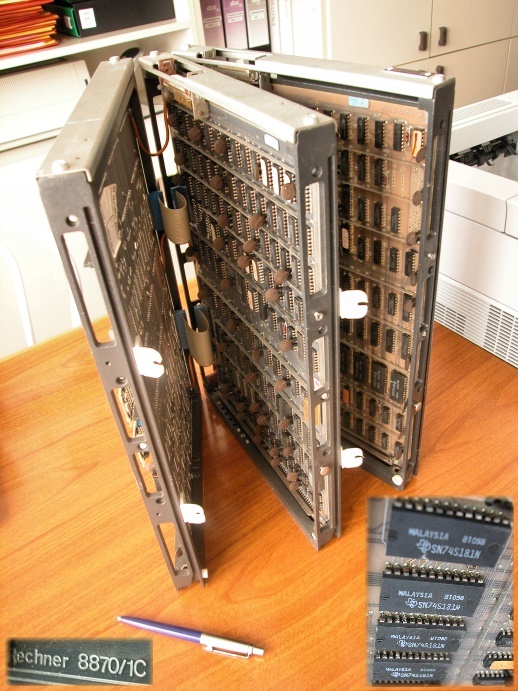 The picture on the left shows an early 8870 CPU. Two of those boards form the actual CPU, and the other board is some internal memory; probably around 128 K-words. The early CPUs had a 16-bit address and data bus and 5 internal registers. Later CPUs actually moved from bit-slice technology to VLSI and were 32 bit with usually 4 MB or 8 MB of internal memory. Those of you who are eagle eyed enough, may recognise this CPU instruction set. From what I can find, and with the exception of the I/O instructions and the fact that the instruction bits seem to be reversed, this my friends, is the instruction set of a Data General NOVA.